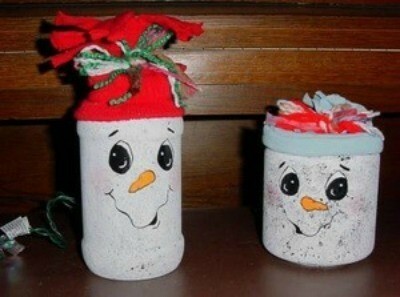 Make this cute decoration for the holidays. It is not only decorative but useful too. This is a guide about making a snowman nitelite. This is a simple, eye-catching snowman that lights up. Take an empty jar or glass container (as you can see by photo, one is an empty Ragu jar, the other one I bought at a thrift store), clean outer surface with cotton ball and alcohol so paint will stick. Using piece of sponge, lightly sponge entire outer surface of jar with white paint (one on the right was done with more coarse sponge). When dry, paint on eyes, orange carrot nose, and mouth, let dry. Take one glove, cut off fingertips and then slit each finger to hand part of glove. Place string of 20 clear lights inside jar. Pull glove over top, tying with colored yarns (the one on the right has a piece of blue knit that I seamed up the back). When plugged in, the light shines through, making children delighted! The only cost incurred was $1.50 for lights, and I bought 2 pairs of red gloves at WalMart for $1.30. I had the jars, but also bought 8 different glass containers at the Thrift Store for 25 cents apiece, making these very economical and cute Christmas gifts. I have given all mine but these two away, and everyone raves about them! These are very cute but I cannot imagine making them in 15 minutes. It would take me that long to clean out the jars. Ha!Ha! You are a real artist. The faces are cuter then I could ever manage to paint. Truely Adorable!! You did the faces so perfectly! These are adorable. These would make great gifts for co-workers. I may have to try some next year. Thanks for the great craft idea! Just adorable! I can't draw so maybe I'll spend a week just trying to get the face just right on paper first! HA!